Today we introduce another much requested feature: Task audit. This is the feature that won our second poll, which you voted from June 9 to June 21. It allows you to view the entire modification history of any task. From the moment it is created, all changes to task properties (even files attached!) are recorded, along with their time stamp and the user who changed them. Who set this task's due date to happen so early, and when? Who changed the description of this task, and what was its value before the change? Who changed the priority of this task to High and when? You'll find it in the task detail page: the last couple of changes are always displayed in the right hand column, and you can get the full picture by clicking on the Details link. We expected this to be a lifesaver for busy projects – and it is – but to be honest we find it extremely useful for simple ones too! While this feature has been refined recently and unveiled today, its development started a few months ago, so you can already see the changes for the last 6 months! Buttons indicating busy activity don't show their text label anymore (ex. : "Loading", "Saving"). Instead, they simply show an universally understood loading indicator. API weren't allowing the creation of tasks for a contact, case or deal. In some cases, Timers were erroneously using too much CPU. 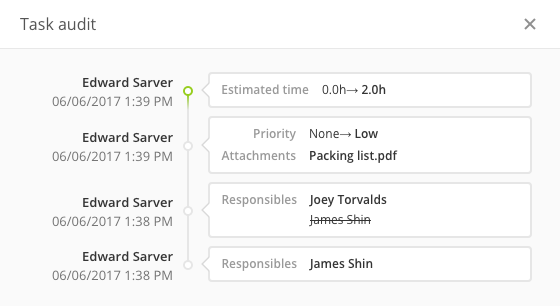 Files attached to a task created via email weren't showing up in task lists, while they were in the task detail page.